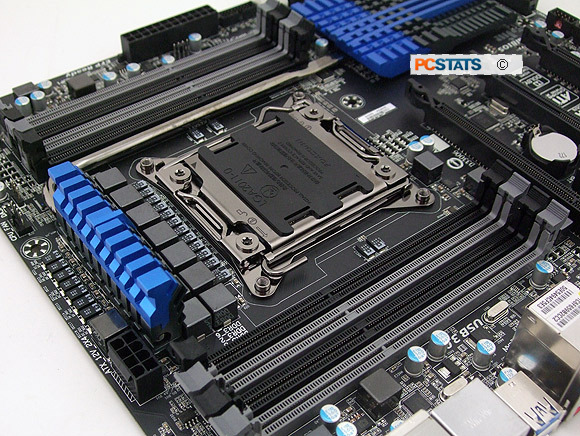 The Gigabyte GA-X79-UD5 is a large E-ATX size motherboard that measures: 30.5cm x 26.4cm in size. 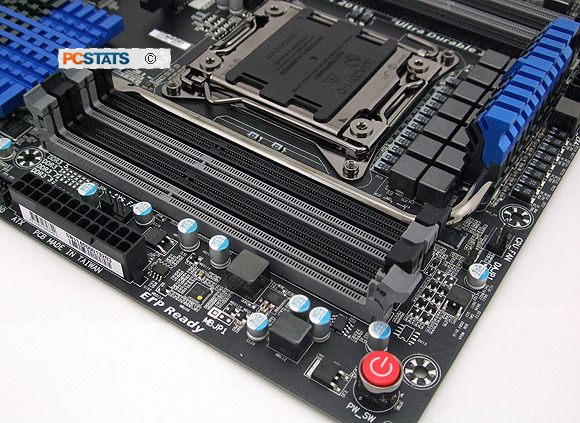 Power requirements are modest though, the board has just one 24-pin ATX power and one 8-pin ATX-12V power connector. In the PCSTATS labs we had no problems running a fully installed system on a high quality, passively cooled Nofan A-PFC 400W power supply (100% silen!). With more than one videocard a 600W or 750W PSU would be most appropriate. The board's main power switch is coloured RED and located in the upper right hand corner by one set of memory DIMMs. It's illuminated orange when the system is powered down. Powered up, the I/O power button symbol glows blue. I like the big red button - it's both easy to find on the massive board and looks good. 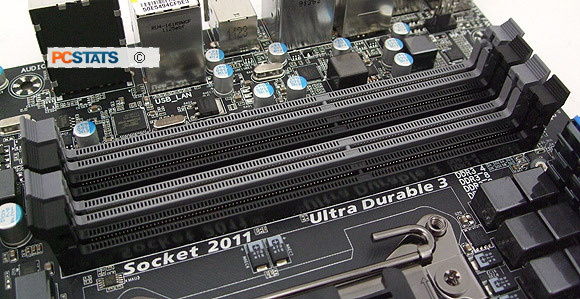 Compared to other Intel X79 platforms, the key selling point of the Gigabyte GA-X79-UD5 motherboard is memory capacity; this board has eight DDR3 DIMM slots available. EIGHT! With these eight RAM slots the GA-X79-UD5 has the rather impressive quality of supporting up to 64GB of quad-channel DDR3 system memory under a 64-bit operating system like Microsoft Windows 7. Mind you, while 4x4GB RAM is dirt cheap (~$120), 8x8GB RAM will run you about $600. Installing a 32-bit OS would limit system memory to just 4GB, so clearly this board is made with 64-bit operating systems in mind. Gigabyte's GA-X79-UD5 motherboard supports quad channel DDR3-2133/1866/1600/1333/1066 memory. 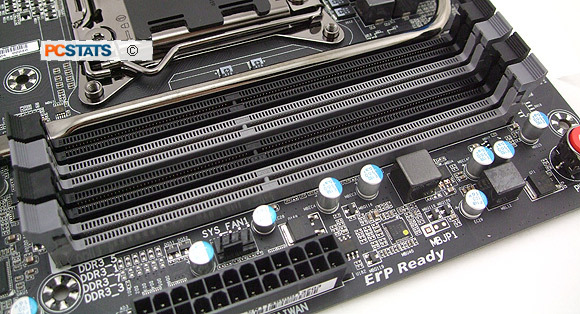 The eight memory slots closely flank the large LGA2011 processor socket, so depending on the size of the CPU heatsink you may need to shop for low profile DDR3 memory modules. The DIMMs all support Extreme Memory Profiles (XMP). Socket LGA2011 for Intel Sandy Bridge-E processors. Intel X79 platforms support 32nm 2nd Generation Intel socket LGA2011 'Sandy Bridge-E' Core i7 processors. The heatsink mounting holes are spaced differently than previous socket 775 and socket 1155/1156 platforms and use threaded metal lugs instead of the through-PCB holes we're accustomed to. The hole spacing is actually the same as Intel LGA1366 processors, but because Intel switched to threaded metal posts you cannot install older LGA1366 heatsinks onto an LGA2011 motherboard. Time for a new heatsink.... good thing companies like Noctua offer free brackets to retro-actively make older model coolers compatible with the new LGA2011 processors! 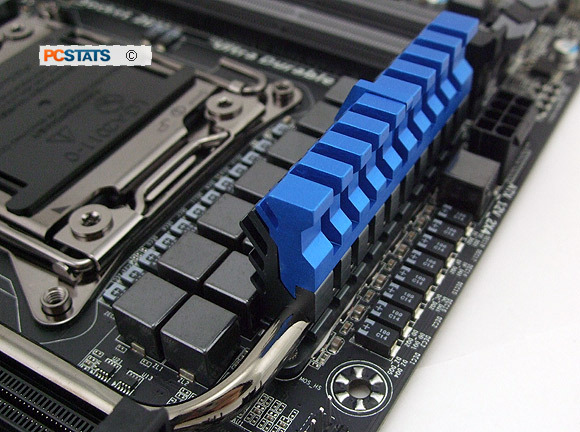 If in doubt, just look at Frostytech's Top 5 Heatsink chart. One of the other nice things about the GA-X79-UD5 board is the compact processor VRM located off to the side of the CPU socket. 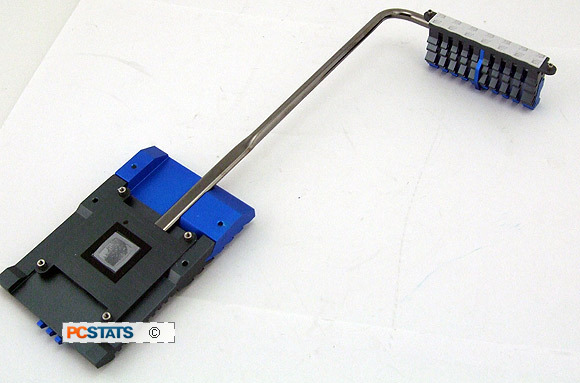 The driver MOSFETs are cooled with a slim, passive blue aluminum heatsink. The 3-in-1 driver MOSFET combines the functions of a SOP-8 driver, LFPAK H-side MOS and LFPak L-side MOS into one compact board mounted IC package. The benefits of this are lower power loss, higher power efficiency and reduced CPU VRM temperatures. Gigabyte claims that this component choice is more efficient with higher switching frequencies than previous circuit designs. With the VRM heatsink removed, from left to right we have the Intel LGA2011 CPU socket, a row of highly-conductive polymerised Tantalum capacitors (SMD), low RDS Ferrite core chokes, driver MOSFETS and finally more Tantalum capacitors. It's not known if Gigabyte's component suppliers utilize 'Verified Conflict-Free Minerals' in the manufacturer of the Tantalum caps. A slim passive heatsink cools the Intel X79 chipset. This heatsink is connected via copper heatpipe to the motherboards' processor VRM heatsink. 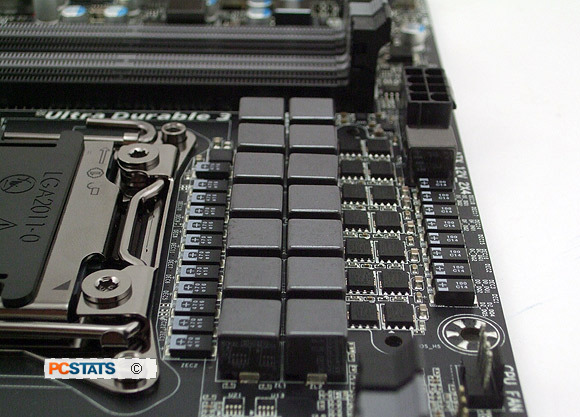 The Gigabyte GA-X79-UD5 is equipped with a 14-phase VRM, and given the limited space on this Intel X79 board it's not surprising that Gigabyte chose Hi-C solid state Tantalium caps - these take up far less space and are rated for a significantly longer lifetime. Gigabyte has manufactured the GA-X79-UD5 on an 8-layer PCB, with two 2 ounce copper inner layers that offer improved impedance and signal quality, it also reduces EMI. The extra copper lowers board mounted component temperature by acting as a massive, heat conduction backplane.